Oops, I did it again... I stopped by at Shoebaloo again, saw a nice pair of shoes again and bought them again. 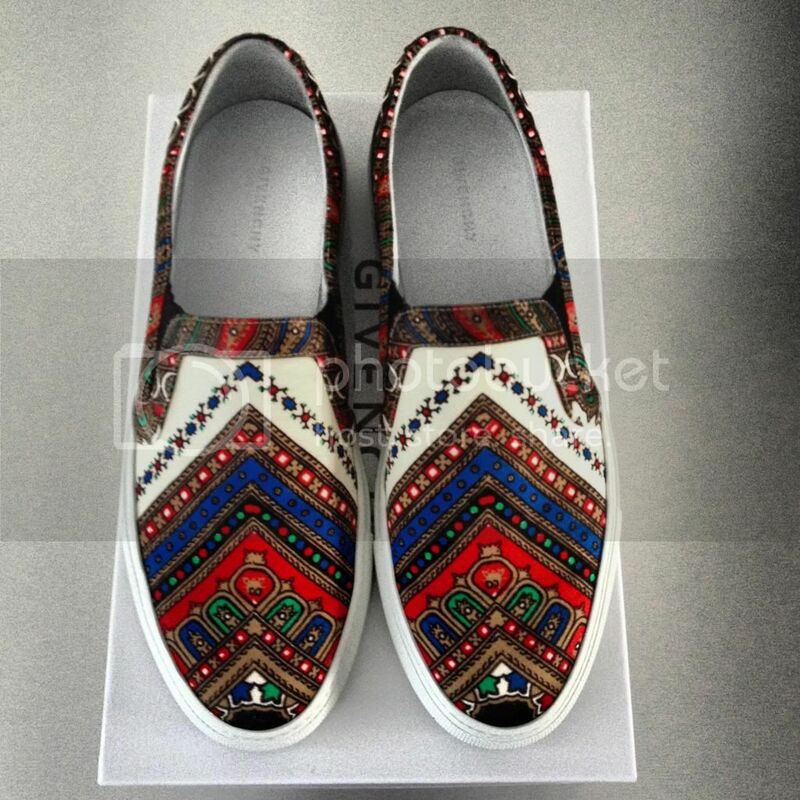 I've been a fan of Vans ever since my first years in high school - and that's a long time ago now, boohoo - and even though these slip ons by Givenchy aren't a collaboration with Vans (like Kenzo did), they sure are inspired by them. When I was in my second year of high school, I decided to buy the classic black and white checked Vans. When I wore them to school for the first time, people stared at me as if they'd seen a ghost. Checked shoes? Oh hell, that was a no no at that time, or so it seemed. Two weeks later, about a dozen of other people were wearing them. I'm not saying I'm a trendsetter, but that's how it goes around here in my little home town: one starts something, the others follow. I only wear my old Vans to festivals now, since I've worn them to death. But when I saw these babies by Givenchy, I got a bit nostalgic. Plus, the colors and patterns are too cool. Imagine them with a pair of skinny jeans or with a pair of shorts. They're also a great option to wear for when it's still too cold to wear my Chanel espadrilles. P.S. : My mom hates them. P.P.P.S. : My sister is selling her Marc Jacobs 'Ursula Bowler' bag, which is known from the campaign with Meg White from the White Stripes. If you're interested, you can have a look at it here. Ik ben niet zo een grote fan van de vans X kenzo (behalve 1 paar ervan) maar deze vind ik echt super!!!! Wat een PRACH-TI-GE print! :-O VERLIEFD! Oeeehhh wow Krizia! LOVE LOVE LOVE! Givency zelf heeft ook hele mooie enkel sneakers en I like the Chloe x Vans ook way much! Weet je, af en toe moet je gewoon iets moois kopen en dat zijn ook de dingen waar je heel lang mee doet! You made the right choice ;)! Ik vind ze heel erg mooi! WAUW love them!! I've also featured them on my blog but they're not in my possession yet;)! !